SNES Mega Man X (USA v1.1) in 32:00.6 by Wodball. 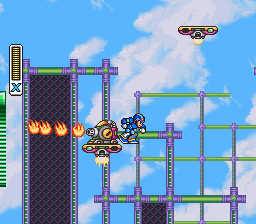 The Mega Man X speedruns are becoming more interesting by every new release. This version beats Frenom's previous version by 106 seconds. For extra curiosity, the page "Mega Man X Tricks" explains some of the tricks that are and/or can be used in the X series games. Takes no damage, except where it belongs to the plot.